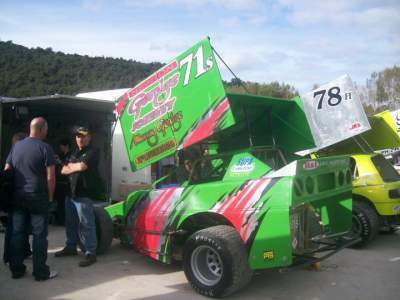 There was not a cloud in the sky as a reasonable crowd gathered on a hot day for the New Zealand Modified Title. 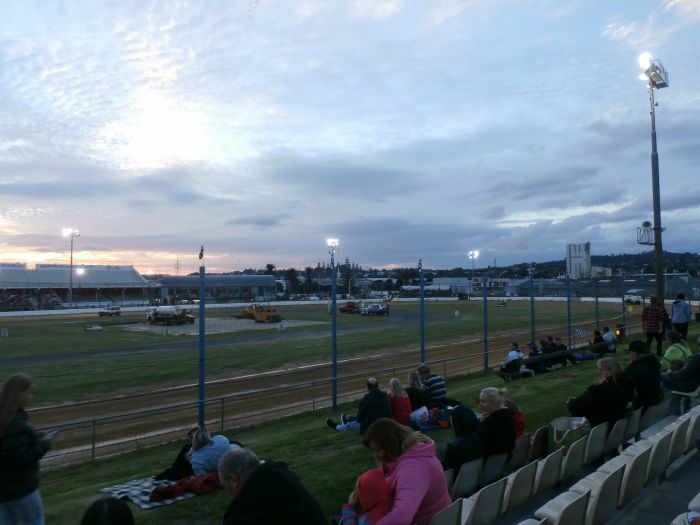 The day cooled remarkably during the evening but the action on track was hot, particularly in the Stockcar class. 3 heats were used to accumulate points for the one race final. 89a Luke Brown was the top scorer and chose pole with 7c Hayden McKay the pace setter. 21h Gary Parker and 17w Jonas England comprised the second row. 21s Newton Gordge and 54gm Steve Thompson the third row. Other notables included 119h Brad Lane from grid 9 (huge rollover in heat two), 1nz Jamie Fox from grid 14 (multi-car crash in heat two) and 2nz Bunter Pierce grid 15 (heat race dnf). 21 cars faced the starter out of the original 23 entries, the non starters being 81a Kevin Shannon and 78h Mike Harrison. 119h Brad Lane and 17w Jonas England required a 3-minute bell prior to the race, both assumed their grid position. The initial race start couldn't have been less successful. 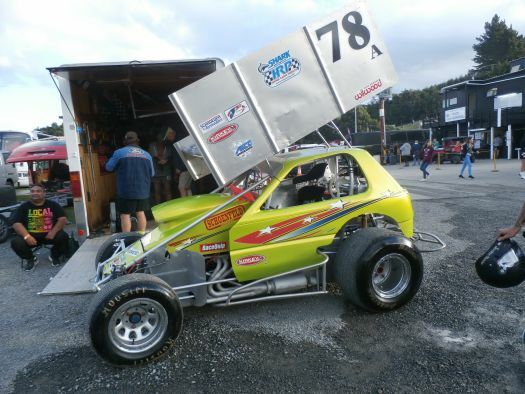 The race went green with 78a Ray Chatfield stranded in pit bend. He got going as the field roared into Cemetery Bend. Contact in the mid-pack saw 54gm Steve Thompson go for a wild ride. He emerged unscathed though one suspects his wallet will feel some damage this week! 21s Newton Gordge was a non-starter, pushed to the infield. On the restart McKay got the jump but was called back by the officials. At the second time of asking McKay got away again, this time to the satisfaction of the officials. The lone Christchurch representative building an early lead. Behind him the big mover was Fox who fired around the outside on the opening lap in spectacular fashion. He had to make his move early because the track crew had failed to establish a second line, focussing on watering the entire track during the night and rolling any little bump that might have appeared. Concentrating on an outside line whilst letting the pole slick off wouldn't have gone astray. Anyway, the opening stanza of the race saw some exciting action between the likes of 3nz Bloeman, 31s Lowry, Fox and Lane for the minor placings. Brown closed the gap to race leader McKay and was on him when the caution flags waved for the first time. 17w Jonas England suffering what appeared to be a steering breakage, performing a miracle to keep the car off the wall whilst not making contact with the field. McKay led away on the restart but Brown was able to get by in Cemetery Bend to take the race lead. A few laps later disaster struck as McKay lost speed, drifting back through the field before retiring to the grass. Meanwhile Fox had used his restart prowess to vault into the fourth spot. The race settled into pattern through the middle stages. Brown stretching away from 21h Gary Parker with the battle on the track for the third spot as Bloeman held out Fox and Lane. Fox considerably straighter than Bloeman on exit but unable to force a move. The race went through until lap 15 when 31s Farron Lowry and 32gm Iain Whyte became locked together on the exit of turn two. That incident took the field down to twelve cars and that soon became 10 when on the restart 22s Aidan Crawford spun in Pit Bend, 63a Daniel Crumpe unable to avoid and adding himself to the flip count for the night. The last 10 laps of the race would run without further incident. Brown led away from Parker, Bloeman, Fox and Lane. It probably wasn't the most exhilirating 10 laps in the history of NZ speedway but when a NZ title is on the line there is always tension. Parker began closing the gap to Brown with around 5 to go. That was followed by Bloeman running wide in Cemetery, allowing Waikaraka's favourite son Jamie Fox up the inside and into the 3rd spot. Fox had nothing for the lead duo and while Parker continued to close to Brown he wasn't able to mount a serious challenge. Luke Brown your new national Modified champion from Gary Parker and Jamie Fox.